What are Robots.txt files and why are they blocking pages from being searched? Your 3dcart store has a file called Robots.txt installed within its system that actively blocks certain pages from being indexed by search engines. At the top of the page look for "SEO Settings"
Within that area, you can click on the "Edit Robots.txt File" button to view/modify your Robots.txt files. 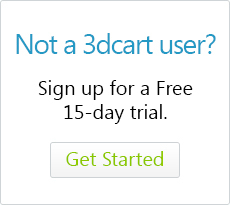 3dcart provides you with already optimized robot.txt files for your main store and secure URLs. Modifying these files should be done by advanced users only. The robots.txt file is a set of instructions for visiting robots (spiders) from search engines that index the content of your web site pages. For those spiders that obey the file, the Robots.txt file provides a map dictating what they can, and cannot index. Why are they installed on my website? 3dcart has purposely installed robots.txt files to keep search engines from spidering certain pages. For example, the 'View Cart' "add to Cart" and Ship Quote" pages are session specific pages which apply to individual customers carts before they proceed to the final checkout sections. Since it's specific mainly to the visitor's browser session at that given time the Robots.txt file prevents a spider form accessing these pages. Otherwise, if search engines were able to spider these pages, it is likely that you would see bogus orders and "Add to cart" errors generated on your store. The Robots.txt files can also act as a security measure in order to protect certain pages from being accessed by unwanted functions. Rest assured however that a Robots.txt file does not affect your ranking on search engines in any way. It's merely there to keep spiders from accessing pages and causing false data.